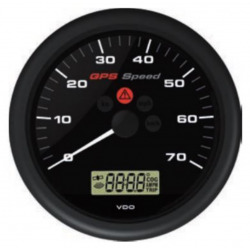 The GPS Speed gauge is ideally suited for horizontal mounting. Vertical mounting is also possible, however performance may be impaired. The gauge can be installed in open vessels as well as cabins. For cabin installations the signal will be stronger if the gauge can “see” the sky. Objects or a narrow view may disrupt the signal. in the chosen mounting area before drilling/cutting holes in the dash panel. 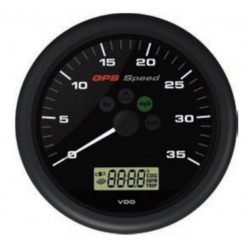 Gauge to indicate Speed over ground, Course over ground, Time, Trip distance and time. Also providing data in NMEA 2000. All ViewLine gauges have interchangeable bezels in different colors and profiles. Create your own gauge with the clip-on bezels in different colors and profiles. Panel hole diameter: 110 mm - 4 3/8"